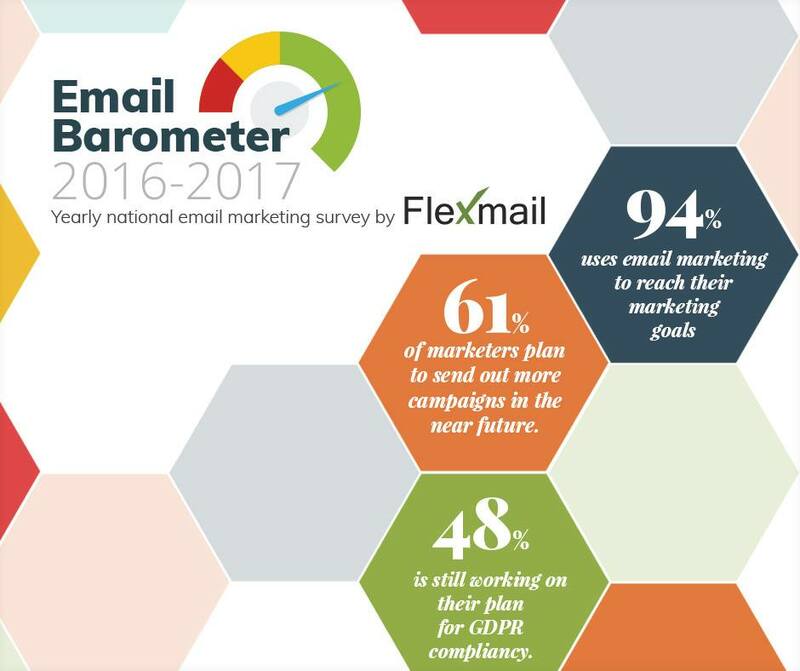 Flexmail recently interviewed marketers about their use of e-mail marketing and used the collected information to produce the E-mail Barometer for 2017. How can they measure the success of their e-mail marketing campaigns? What obstacles do they face? And, most importantly, is there still room for improvement? One thing is certain: e-mail is not dead – quite the contrary! Flexmail Email Marketing Solutions from Genk is an e-mail marketing company that was awarded with gold in the category “Best performing Belgian tool” at the Digital Marketing Awards 2016. As every year, the company has produced a report exploring the experiences and expectations of domestic and foreign marketers. This year, with the impending introduction of the GDPR, they wanted to focus explicitly on the new legislation: how do marketers feel about it? And how do they prepare for May 2018? In honour of the GDPR, Flexmail have already launched a series of communications, but according to the report, companies still have a lot on their plate. Most of them apparently admitted that they are not or almost not prepared for the introduction of the GDPR. Marketers indicated they would increasingly use e-mail marketing campaigns in the future, but they still need to optimise their strategy. In addition, marketers want to invest more in e-mail marketing in order to achieve better results. Certain features, such as AB testing, are too often unused, and those are missed opportunities. Are you curious about the results? Compare your strategy with the results available on www.emailbarometer.be.